For the second time this month, I’ve read a novel that actually reads more like a collection of short stories. But unlike my previous experience, I really enjoyed Elizabeth Strout’s Olive Kitteridge. 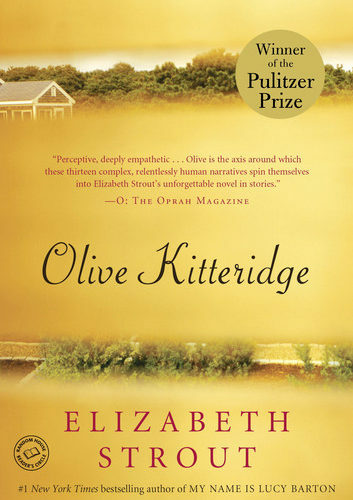 The 2009 Pulitzer Prize winner for literature, Olive Kitteridge is a collection of stories set in a small town in Maine. The common thread that ties them all together is a local school teacher and namesake of the collection. Olive is strong-willed, brash, opinionated and sometimes even cold. However, she loves fiercely and deeply and through the eyes of her fellow citizens the reader see a women who is respected for her truth-telling and loyalty. Anyone who has lived any amount of time in a small town will recognize the characters in Olive Kitteridge – the widow embarrassed by her husbands infidelity; the mother loyal to a son who has committed an unforgivable sin; the young man on the brink of suicide because he never quite outran his troubled youth; the older married couple thankful they’ve outlived their storms and can now enjoy the “dessert” of their relationship; the floundering live-in girlfriend desperate for her lover to commit; and many others. And, most readers who have struggled with wanting to love well but who acknowledge they fall short will see a part of themselves in Olive. It isn’t always pretty, but it is true. Olive’s own story contains her husband, Henry, and her son, Christopher. Her son marries a strong woman (not unlike Olive) who moves them across the US to California and then divorces him. In their later years Henry suffers from a stroke and loses the ability to communicate with Olive. Her character is tested immensely with both men. One review I read of this early on recommended it for book clubs because there was so much to talk about. I whole heartedly agree. There are many complex characters who warrant their own discussion. Add Olive to that and you’ve got an evening of laughter, wonder and honesty. Update: I HIGHLY recommend the HBO miniseries based on this book! Frances McDormand is brilliant as Olive Kitteridge. A great book–I recommend it to everyone. Yes, Misti – this is a must read! Thanks for reading & posting, Lamar! Welcome! I've been telling myself I'll read this "next month" for over a year now. Clearly I just need to do it! I love novels in stories, I love books about small town life, and I tend to enjoy the winners of the Pulitzer. So I think this is most definitely a book for me. I loved Olive Kitteridge, and I am not a big fan of short stories. Great review. Nymeth- I was the same way & it took my book club picking it as a read for me to finally do it. Well worth it, though! Hi, thanks for the review, Ive wanted to read ever since it won the Pulitzer Prize but haven't found that many reviews for it on blogs. Hey, Jessica – Keep looking. I've read several really good reviews of Olive. But I guess the best advice would be stop looking for reviews & just pick up the book! You'll be glad you did. Thanks for stopping in at Babbette's!